A former Los Angeles defenceman returned to Russia before the United States Citizenship and Immigration Service deported him. Back in July, Vyacheslav Voynov had pleaded no contest to a misdemeanor charge of domestic violence against his wife, Marta Varlamova. “I’m glad to be back home,” he told Sport Express. He skated with Russian national team coach, Oleg Znarok, back on the ice for the first time (Voynov said) since he ruptured an Achilles in March. He wouldn’t say which KHL team he was going to sign with — negotiations are still underway. Asked about coverage of his case in the press, he said he was avoiding it. In not unrelated news, the Los Angeles Kings announced a suite of new off-ice Conduct Awareness Training Initiatives. The Kings are also adding: programs to better educate players about the risks involved in drug and alcohol abuse; sexual harassment training; a “conduct awareness program;” a new Player Assistance position, focussing “on the challenges of addiction and substance abuse. An Anaheim defenceman, meanwhile, shot a five-year-old Grizzly bear named Cheeky. That was in British Columbia in 2013; this week, Clayton Stoner learned that he’s facing five charges under the province’s Wildlife Act. He’s due to appear in court in Vancouver on October 9. A legendary Montreal right winger continued to eat uncooked hotdogs — as in, raw — before Canadiens’ games at the Bell Centre. 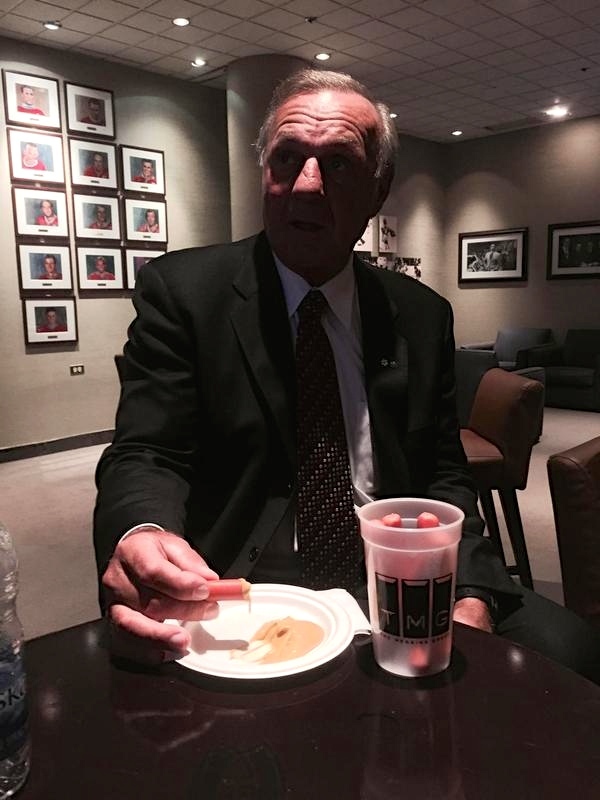 Chris Nilan (@KnucklesNilan30) was there to document Guy Lafleur, at shadowy right, partaking in what I guess is a longstanding ritual, with a side of mustard. “And who,” tweeted the writer and journalist Wab Kinew after Wayne Gretzky appeared at a Toronto event to endorse Conservative leader Stephen Harper, “is Jagr supporting in the Czech parliament? The Social Democrats or the Civic Democrats? Unfortunately, my body broke down on me sooner than I had hoped. I’m 32 years old and you’re likely to find stronger and more stable ankles and feet on the residents at your local nursing home. 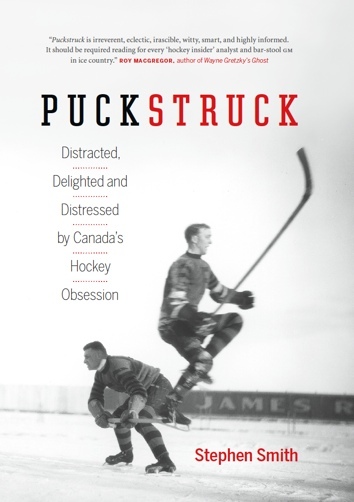 After Montador was found dead, his brain went to the Krembil Neuroscience Centre at Toronto’s Western Hospital where neurosurgeon Dr. Charles Tator runs the Canadian Sports Concussion Project. Montador, who was 35, played 614 NHL games before he retired. Study of his brain revealed signs of chronic traumatic encephalopathy (CTE). Dr. Tator was in the news this week after another retired player died, Todd Ewen, an apparent suicide. “You can’t just bury your head in the sand and think there is not a connection,” said former NHL player Mathieu Schneider, a special assistant to NHLPA director Donald Fehr. Dr. Tator, for his part, is hoping that the Ewen family will consider donating his brain for study.